It is Bollywood shining with 'Singham' as well as 'Zindagi Na Milegi Dobara' turning out to be bumper hits at the box office. However while it is a 'khushi' scenario for those associated with these two films, there is a lot of 'gham' in store for near half a dozen films that have been lined up till 'Aarakshan' strikes. This was pretty evident from the reception that three new films - 'Gandhi To Hitler', 'Khap' and 'Bubble Gum' - met with over the weekend. "Such strong have been collections of both 'Singham' as well as 'Zindagi Na Milegi Dobara' that no distributor or exhibitor is willing to reduce the number of shows for them," says a filmmaker who is waiting for his long pending film to make it to theatres, "Multiplexes as well as single screens aren't giving any chance whatsoever to the new films since they are in any case minting money. He couldn't have summed it better since none of the three new releases of the week fetched more than one or two shows in theatres. In fact a couple of them couldn't even manage an all-India release. Worse, not many critics even bothered to review these films which mean any hopes of word of mouth or good critical acclaim reviving their fortune was out of question. That they weren't exciting products to begin with further diminished whatever little chances that they had to survive. "The trend would only continue till the release of 'Aarakshan' which is slated for release over the Independence Day weekend," says a trade pundit, "For theatre-wallahs this is the best possible phase that they are enjoying. 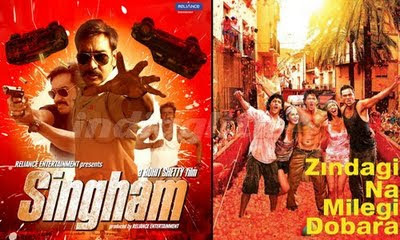 After all single screens have been busy with the likes of first 'Murder 2' and now 'Singham' while multiplexes have been smiling away from 'Delhi Belly' to 'Zindagi Na Milegi Dobara'. In between there was 'Double Dhamaal' that made some quick buck as well while 'Ready' was the 'baap' of them all. Choti pictures ka toh koyi chance hi nahi hai." Well, that's a stark reality which means though there would be a gap of a few more weeks, it would again get back to the game of big bucks once Salman strikes with 'Bodyguard' this Eid.